For beginners, pro and p eti ts spaces. 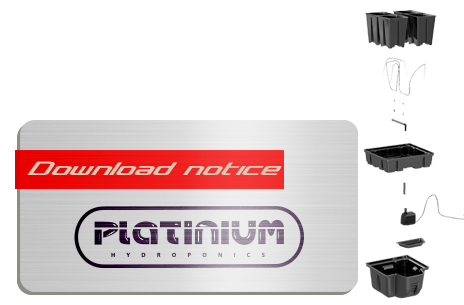 Platinium Hydro ponics systems HYDRO 100-12 sites are the latest in our cropping systems. Compact, they grow up to 48 plants, depending on the size of the crop. In the HYDRO version, as in the AERO version, the PLATINIUM Hydro ponics systems are easy to assemble and to use. - The pots are contained in their own tank, there are no possible leaks. - Their compact dimensions of 100 x 99 x 38.5 cm allow to adapt to a large number of spaces, including balconies. - A large volume of water (90 L) for a relatively low number of plants, ensures a good reserve, and participates in the regulation of the pH. In black ABS, to protect the roots of light. Hydro version, on clay balls, ideal for beginners and professionals. The Hydro Pro and AeroPro systems are easy to use, reliable and economical. - Each pot can be served individually, which allows to water each plant according to its needs. They are also removable, so they can be moved easily. - Extensible, they pass easily from an installation of a few pots to commercial installations of several thousand units. - One can transform a PLATINIUM Hydro Pro into AeroPro and vice versa, in no time. This maneuverability gives them the enormous advantage of adapting to different seasons. On hot days, you can work with the clay beads that protect the roots. And move up to speed with the Aero version as soon as the coolness comes back !!! The HYDRO and AERO versions are available in standard sizes in 40 x 40 cm, 60 x 60 cm, 80 x 80 cm, 100 x 100 cm or 200 x 100 cm. Then, you can accumulate them to each other. The tank contains 90 liters, which helps to stabilize the pH and EC of your solution and gives you more autonomy. Easy access with removable hatch and graduation allows to quickly visualize the level of solution. Dimensions: 100 x 99 x 38.5 cm. Pump MJ 1000 1 year warranty, irrigation bag and mounting guide included. A real quality 100% food ABS plastic equipment in its entirety, the new range 2012 PLATINIUM Hydro ponics . A FRANCO-CANADIAN COLLABORATION : Made in Canada and developed in France.